Backing up your data is essential. Let’s face it; our computers are a bigger part of life than ever before. We shop, work and play using computers. We store our Family Photos, our emails, our Finances, our digital lives are stored on our PC’s. At this time of year we’re heading into “Thesis Season” where I start getting calls from students who have managed to keep all their course work on a Thumb Drive and guess what – “it no longer works!” So come on folks, take a minute to back up your files, and save yourself from the unnecessary stress of losing your Family photos, emails, course work, accounts etc etc. Computers aren’t perfect. Apart from all the on-line threats to our data, there are some local ones. Files can become corrupt and hardware can malfunction. The PC’s can even be stolen. The best defence is to back up your data. There are a number of ways to do this. Data backup software. Backing up data is vital for businesses, lost information can cause a major crisis or worse, it can lead to business failure. Individuals who don’t backup computer data run the same risk. While this may not cause financial ruin, it can certainly be frustrating and even heartbreaking if for example you were to loose your baby’s first steps or other family events. So why do so few of us practice data backup? “I’m too busy to backup my computer.” We are busy; work, family and friends fill our days and leave us little time for boring things like computer maintenance. But today’s backup software manufacturers make it easy. Through scheduled backups, your system can automatically perform a backup that fits your needs at an interval you choose – without interrupting life. “I don’t know how to backup data.” Like preparing for a natural disaster, most of us understand how important data backup is, but don’t know where to start. A big step is deciding how you are going to store the data you backup. “My computer won’t crash.” You’ve had your computer this long and haven’t had problems so far why worry about computer backup now? Data backup is about protecting your data’s future, but with computers, it isn’t if you crash, it’s when you crash. Another good data backup option is to backup to an off-site location, which allows you to backup a file, a folder or your entire hard drive to a separate location online. 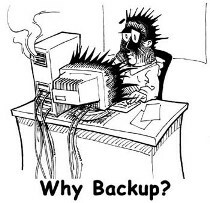 Depending on the amount of Data you want / need to backup there are a variety of options available. The per month pricing starts at free. In today’s high-tech world of sneaky spyware and venomous viruses, you are in more danger of data loss than ever before. At least with a current backup, you can minimise the threat.